While finding skilled writers and editors may be paramount to your content marketing efforts, it’s critical that you don’t forget about imagery and visual content. When it comes to positioning your blog as a premier source for quality content and ideas, images go a long way in pushing you to the top. The issue is that very few bloggers and content marketers realize that this is the missing piece. Tweets with images receive 18 percent more clicks than those without. In 2014, the amount of video in people’s Facebook newsfeeds had increased 3.6 times over. In 2014, 39 percent of B2B buyers claimed they share infographics more frequently than any other types of content. You could literally highlight hundreds of similar statistics, but these three give a pretty clear indication of where the industry is headed. Marketers and advertisers are relying on visuals, and so should bloggers. Original pictures. Your first option is to start with original photography. Internet users prefer unique images over stock photos, so it’s a good idea to use original pictures whenever possible. Unfortunately, most people aren’t skilled photographers and editors. However, if you want to try your luck at taking your own photos, avoid making the following mistakes, as provided by EyeEm: Not having a clear subject matter/focal point, getting the composition wrong, not getting close enough to your subjects, not experimenting enough, and not shooting enough. Keep these in mind, and you’ll achieve a much better outcome. Hire a photographer/designer. The second option is to hire a photographer or graphic designer to create your own set of unique visuals. Depending on your output volume, this can add up pretty quickly. This is really only an option when you need a particular image or visual that you can’t find elsewhere. Google image search. If you’re looking for free and easy – but don’t necessarily care about the image being unique to your blog – Google image search is always a good option. Just make sure you use the right search filters to ensure you aren’t using a copyrighted image without permission. Image websites. Finally, there are a number of websites that offer premium royalty-free photography. If you have a small budget, but want unique photography, this could be just what you need. From a blogger’s perspective, different situations call for different sources. By understanding that you have a variety of choices, you can make the best decision in each instance. Stock photos are easy, but are they ever effective? While they’re readily available, easy to find, and simple to download, do you really want people to relate your blog to bland, recycled stock imagery? It only takes a little more effort to find original images – or stock photos that don’t look like stock photos. According to Inessa Bokhan of WebMeUp, there are seven types of stock images everyone must to stop using. They are: freaky and unnatural emotions, happy and organized corporate people, abstract 3D figures, people with laptops in weird settings, quick faking of products, whiteboards/chalkboards/etc., and low resolution images. The most common mistake you’ll see bloggers make when selecting images is choosing ones that aren’t at all related to the topic of the blog. The fact is that humans remember images six times better than text. When publishing a blog, keep this in mind. If you want readers to remember what the blog was about, it’s essential that you choose an image that properly reflects the blog post’s content or message. The majority of blog readers find a post on social media. Usually it’s the result of someone sharing the blog’s title and a thumbnail of the corresponding image. While the title is enough to compel some users to click, most people are more drawn to the image. When choosing images for your blog post, go with something vibrant, unique, jaw dropping, or inspiring. Again, standard stock photography doesn’t fit this description. While a good image is obviously appealing, it should also be quick and nimble. In other words, it shouldn’t slow your page loading time. According to a recent study, 47 percent of users expect a two second page loading time. If your images aren’t optimized, it’s possible that your blog posts could take longer than two seconds to open. It’s recommended that you use photos that are smaller than 100KB in order to make pages load more efficiently. Photos aren’t always the best option. If you’re using the same type of imagery on every single post, your readers will get bored. Mix things up from time to time and don’t be afraid to create an infographic, embed a video, or design a unique graphic. Not only are these vibrant and compelling, but they’re also entirely unique. These visuals are perfect for sharing on social media. The content on your blog may be the most important aspect, but don’t underestimate the value of imagery. Every good blog post is complimented by stellar imagery and design. If you’re ignoring this aspect of the process, you’re missing out on clicks and conversions. 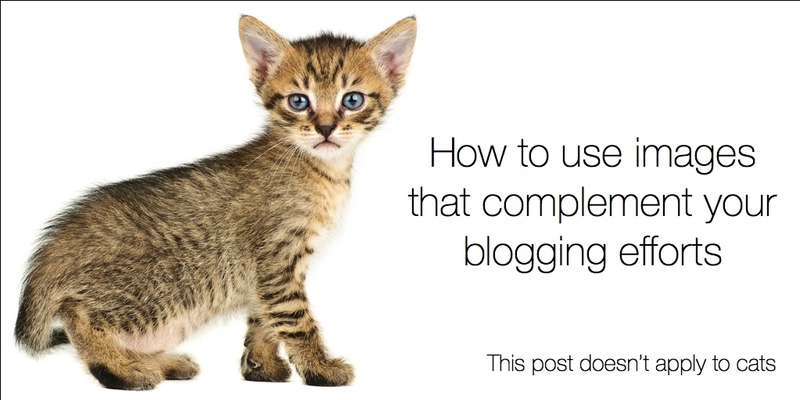 Next time you publish a blog post, keep these tips and tricks in mind. There’s plenty of flexibility in where you can find images and how you can use them. Avoid settling for the status quo and dare to try something different. 4 Comments on "5 keys to effectively use images that complement your blogging efforts"
Say no to stockimages is maybe little bit hard. I fully agree, if you use stockimages which everybody has seen several times all over the web. It does not make sense – but if you use small indipendent brokers as stockbo.com or others, then you buy more or less direct from a photographer. Those pictures are harder to find – but it is legal. Where you are not sure if you “steal” them from Google image search. Hi Wendy! Indeed… Just updated the post, thanks for catching that! Agree with you about Google, I find things sometimes. I personally use Flickr with the commercial rights filter for images and always attribute the source. I believe it’s a good way to get traffic to the photographers as well! I’ll try your two websites in the future, thanks for the tip!